BANGALORE: From the beginning of October all the way up to Christmas, tailors across Bangalore are buried under festival orders. Commercial Street, a haven where the fashion conundrums of people across communities and classes are solved, especially strikes gold during this time. And it’s the ‘one hour delivery’ tailors that are most in demand now. Syed Sadiq, who has a shop in Commercial Street, says that orders this year have gone up compared to the last few years. He specialises in ‘one hour deliveries’, which he sheepishly admits usually take around two hours at least. “Anarkalis are a favourite this season, just like last year,” he informs. Syed’s store dispatches close to 50 items in a day. One can get a saree blouse stitched at Sadiq’s Madeeha Ladies Tailor Shop, situated in Golden Plaza, for `200. An Anarkali suit can be stitched for `500, says the owner. Another haunt that is thronged by people at all times is Star Plaza, a complex that houses at least 30 different tailors in one spot. Customers flock to the complex in hopes of getting their last minute festival clothes stitched and they bring their entire families along. “I don’t want to wear a suit,” cries a five-year-old boy, while his mother tries to cajole him into letting the tailor take his measurements. “I have come to get my entire family’s clothes stitched for Diwali. This time, I’ve decided to come in advance because later none of these tailors take orders,” says Suman Desai. She is looking forward to getting a netted blouse stitched for herself, which she feels is the latest trend this season. “We haven’t seen any sudden spikes in the number of customers,” says Mohammed Kowsar, a tailor at Star Plaza. “The real crowd will start around November, but right now we mostly have the Eid crowd here,” he adds. His shop can stitch everything from a blouse to a full Anarkali set within an hour, and they don’t charge more than `300. 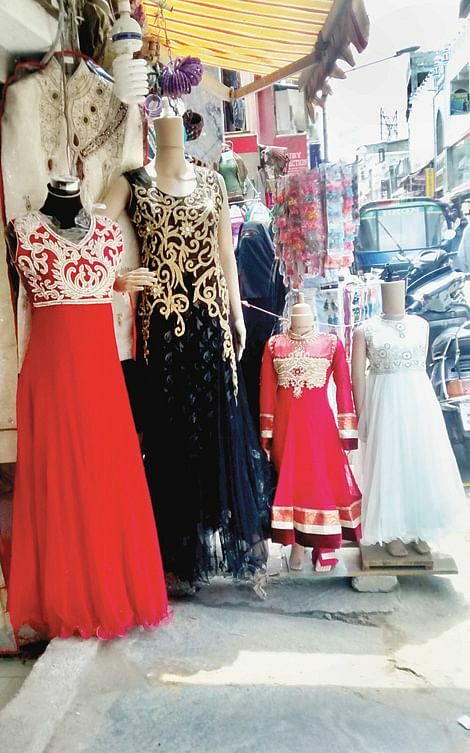 Amruta Landay who runs the 12-year-old tailoring shop, L B Prakash tailors on Commercial Street, feels that although the festival rush has already begun, they are yet to see the worst of it, which is usually around November and December. “Right now, the wedding season has started and we’re also taking last minute Eid orders. We get 30 to 40 customers coming in each day,” says Amruta. While stitching together an entirely new piece takes about two days, Amruta usually takes five days for an order, to ensure quality. “We do take emergency orders as well, where we stitch blouses and dresses within an hour or two, but we charge extra when they want us to do it in very less time,” she adds.